TRIPOLI, Libya - A bounty of $1.7 million has been offered for the capture of Muammar Gadhafi - dead or alive. The bounty has been put up by businessmen but is supported by the rebel leadership, National Transitional Council (NTC) chairman Mustafa Abdel-Jalil said. As the search for Gadhafi goes on, the NTC promised to hold elections in eight months. Tripoli celebrated into the early hours of Wednesday after rebels overran Gadhafi's Bab al-Aziziya compound on Tuesday, despite finding no sign of the Libyan strongman or his sons. Abdel-Jalil told France-24 television that some 600 pro-Gadhafi fighters had been captured but the battle would not be over until the Libyan leader himself was a prisoner. Celebratory gunfire rocked the city when news spread that the insurgents had breached the walls of the Bab al-Aziziya compound in the center of the capital. But Gadhafi loyalists still held out in parts of the city. They had been in control of the Rixos hotel, headquarters of the foreign journalists accredited to the regime. 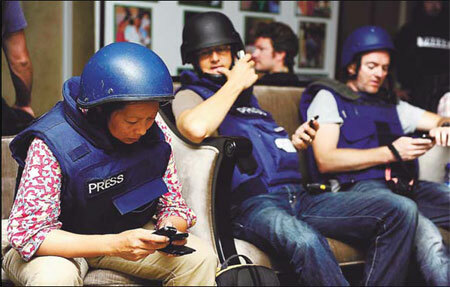 The journalists were allowed to leave the hotel on Wednesday, after days of being held captive by forces loyal to Gadhafi. On the run and his whereabouts unknown, Gadhafi delivered two messages on Wednesday. In a speech carried by the website of a television station headed by his son Saif al-Islam, he said he had abandoned his Tripoli compound in a "tactical withdrawal" after it had been wrecked by NATO warplanes. In a later audio message on the Syrian-based Arrai Oruba television station, Gadhafi urged residents to "cleanse Tripoli of rats". He also said he had taken to the streets of Tripoli without being recognized. "I walked incognito, without anyone seeing me, and I saw youths ready to defend their city," the strongman said, without specifying when he did his walkabout. 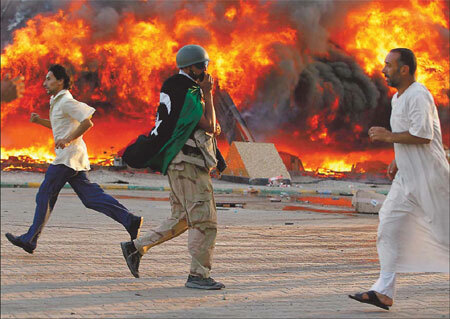 The attack on Gadhafi's headquarters followed three days of fighting in the capital which Abdel-Jalil said had left more than 400 killed and 2,000 wounded. In Beijing, Foreign Ministry spokesman Ma Zhaoxu said on Wednesday that China hopes Libya can achieve a smooth transition of power. "China hopes the new regime can take effective measures while bringing all parties together to restore normal social order as soon as possible," he said. China supports the UN to play a dominant role in Libya's post-war arrangement, and the other countries that make up the BRICS (Brazil, Russia, India and South Africa) should strengthen coordination to play a positive role, Foreign Minister Yang Jiechi said during a phone conversation with his Brazilian counterpart Antonio Patriota on Wednesday. Russian President Dmitry Medvedev said on Wednesday that Moscow would consider establishing full diplomatic relations with the rebels "if they have the energy and possibilities to unite the country for a new democratic beginning". France's President Nicolas Sarkozy will meet Abdel-Jalil in Paris to discuss the situation and "the work of the international community to support the transition to a free and democratic Libya", a statement from the Elysee Palace said. Yang Lihua, a researcher at the Chinese Academy of Social Sciences, said that a leading role for the UN in Libya has long been China's policy. "NATO's military intervention over Libya is based on a Security Council resolution. Now that the combat operations will soon come to an end, it is obvious that the UN should play a dominant role, rather than Western countries," she said. The African Union should play an important role in reconciliation and reconstruction, Yang added, as the organization had submitted constructive proposals. China hopes to further promote economic and trade cooperation with Libya, said Ministry of Commerce spokesman Shen Danyang. "China is willing to play an active role in Libya's reconstruction along with the international community," Shen said at a press conference on Wednesday. As a long-term constructive player in Libya's economic development, China is involved in 50 projects in Libya worth about $18.8 billion. These projects have been suspended. More than 35,000 Chinese citizens, mostly employees in the engineering, infrastructure and oil sectors, were evacuated from Libya as the fighting escalated earlier in the year.